One of the most popular requests in our end-year reader-satisfaction survey was more PHP 7 content. In this quick guide, we’ll cover two ways to bring a PHP 7 server online on DigitalOcean – a popular VPS provider. We’ll use two approaches, the latter of which will be applicable to any Ubuntu installation whereas the former will only work on DigitalOcean. If you don’t have a DigitalOcean account but would like to follow along, feel free to grab two free months via this ref code. 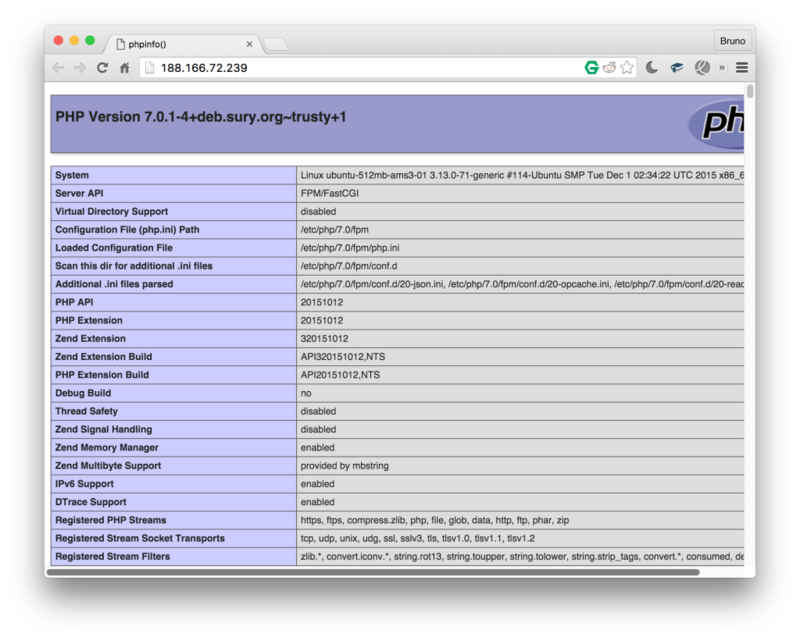 If you’d like to develop with PHP 7 locally, use our Homestead Improved – it’s already running PHP 7 by default. What’s more, it’s almost the exact same setup you’ll end up with by using Laravel Forge below. 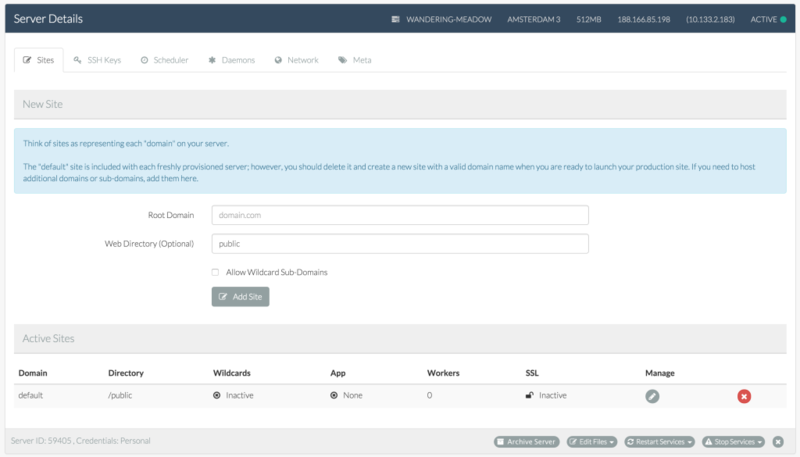 Laravel Forge is a commercial service for deploying and provisioning servers running PHP. It’s a common misconception that everything bearing the Laravel name is immediately related to Laravel and requires it, but this is not true. Laravel is just a brand at this point, one that encompasses many tools – much like one can use Zend Studio or Zend Server without using the Zend Framework. As such, Forge can, at the moment, be used to set up servers for DigitalOcean, AWS or Linode. 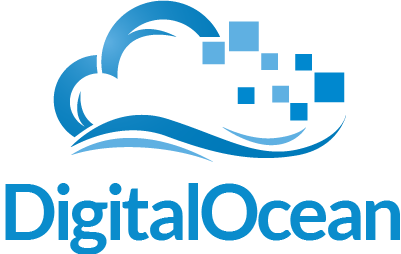 Like we said in the introduction to this post, we’ll be using DigitalOcean. Once you sign up for Forge (there’s a 5-day trial) and set up your account, head on over to the server creation page. Note that while 5 days may seem low, it’s enough for testing out a deployment or two. This doesn’t mean your server will be killed after 5 days – it merely means you won’t be able to manage it from Forge or make new ones after the trial expires. The trial actually does provide you with a full service. Unfortunately, it also requires a credit card – one can hope they’ll remove this requirement later on to ease onboarding of new users. If you’re following along just for the sake of this experiment, select the lowest-tier server. Modify other settings as you see fit. Leave all the checkboxes unchecked – the first one is only needed with high-load applications. The HHVM one is for people who like to live on the bleeding edge and experiment with alternative runtimes. Enable Backup is a DigitalOcean specific option which increases the price of the droplet by 20% and takes weekly snapshots of the Droplet so it can be easily restored if something goes awry. I do not recommend setting this option – it needlessly makes things more expensive, and weekly backups in a world as agile as ours aren’t that valuable – opting for a custom daily backup option instead would likely be a better idea. This is something which should definitely be pointed out in the server creation screen, as it has the potential to become an unanticipated cost. Besides, if needed, it can be activated post-creation on the droplet’s configuration screen in DigitalOcean’s control panel. Once the Create Server button is clicked, the provisioning and creation process will begin. It might take a while. As soon as the server is provisioned, we can configure it via an interface reminiscent of tools like PuPHPet. … to private network setups between servers (so it’s easy to add a separate server as a database only, or one for queues, for example), SSH key upload interfaces, daemons for keeping services alive, etc. Feel free to study them all at your own leisure. 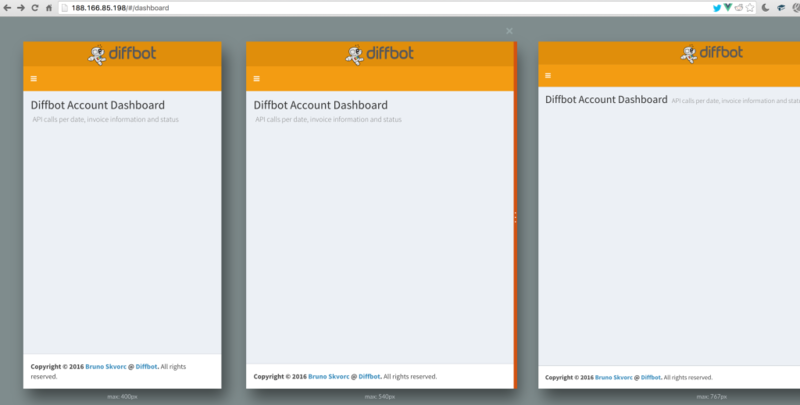 For deploying, I’ve got a small Diffbot account dashboard I’m developing as I learn VueJS, and it seems like the perfect thing to try out. You can clone / fork it here. All good! Now, let’s add a new site. Without setting up a dedicated domain, let’s just use the IP and modify the default site added by forge by clicking the modify button. The very next screen will let us bind a Github repo to the app we’re creating – this is where the aforementioned Dash repo comes in. This type of binding will also let us set up auto-deployment (Quick Deploy, selectable on the next screen) which will re-deploy our app whenever a push to the repo is made. Before we deploy, we need to modify the deploy script slightly by removing the line mentioning artisan – we’re not using a Laravel app, so this would cause an error during deployment. Now we can hit “Deploy Now”. Unfortunately, there is no way of knowing if the deployment was successful – only errors are shown at the top of the screen – but a refresh of the IP in the browser reveals that everything is just fine. With Quick Deploy activated, any change we push will immediately be reflected on our app. Like we said, though, it’s a shame we aren’t notified of new successful deployments in any way. That’s it – it’s that simple to set up a basic app with Forge. Now let’s do the same thing manually – feel free to delete the server from the main Forge screen – it’ll conserve your account credits. First, we manually create a new droplet at https://cloud.digitalocean.com/droplets/new. Same settings as in Forge – Ubuntu 14.04, closest region, lowest tier server ($5). All checkboxes can remain unchecked. Once the droplet has been created, there are several steps to go through. First and foremost, the server should be secured and additional tweaks performed. These steps are not necessary when creating the server with Forge. After this, our server will be live and accessible via its IP address. Now let’s install PHP 7. Now, we need to modify the vhost setup for Nginx’s default site. 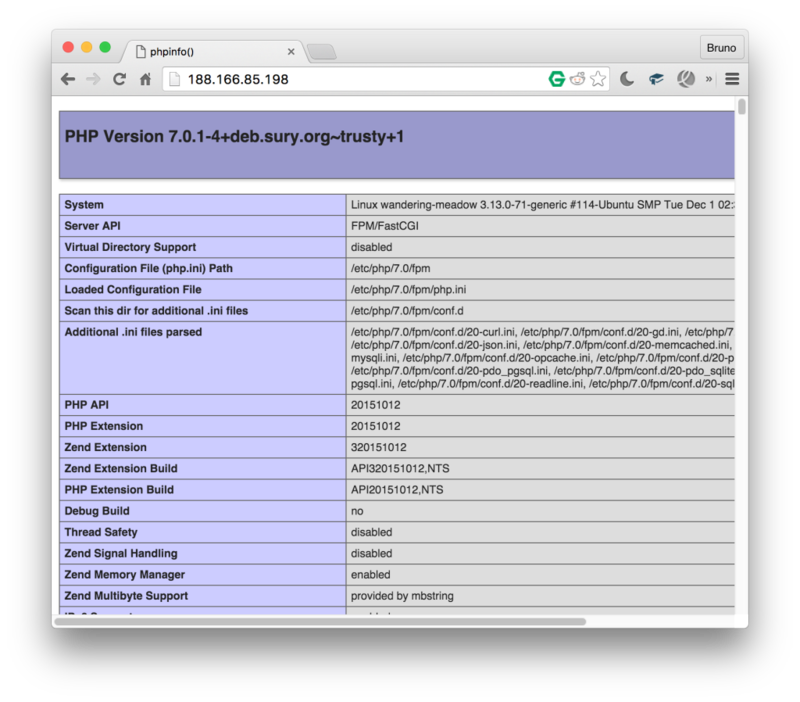 Now that PHP 7 is operational, let’s change the root location of the default server to /var/www/dash/public. Generally, we would be making a new configuration file with a custom root location for every app we deploy, but that would require a custom domain, too – something we don’t have prepared at this point. Once this is done, the app should work just like with Forge – with one exception. Future pushes to the repo would have to be pulled to the server manually. 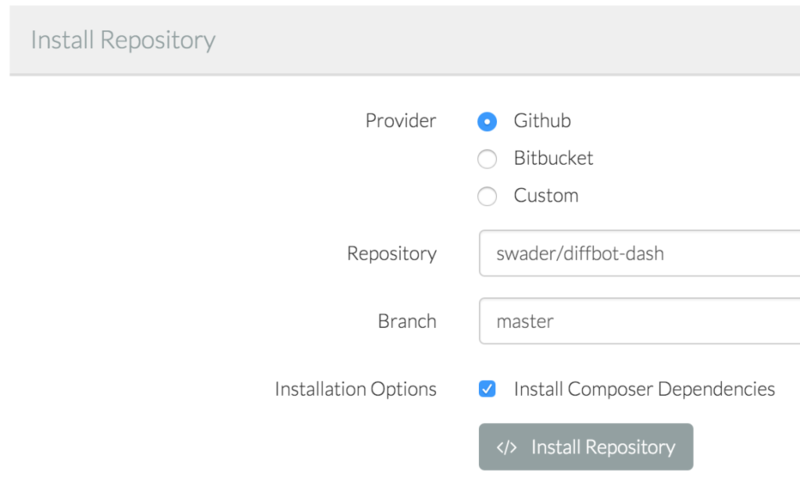 Third party continuous deployment is outside the scope of this tutorial, but we’ve covered it before with tools like Deploybot. Another difference from the Forge approach is the fact that we’ve only installed the bare minimum of software here – no MySQL, no Postgre, not even NodeJS and its hellish offspring, NPM. Everything is very, very manual – full fine-grained control, but admittedly not everyone’s cup of tea. 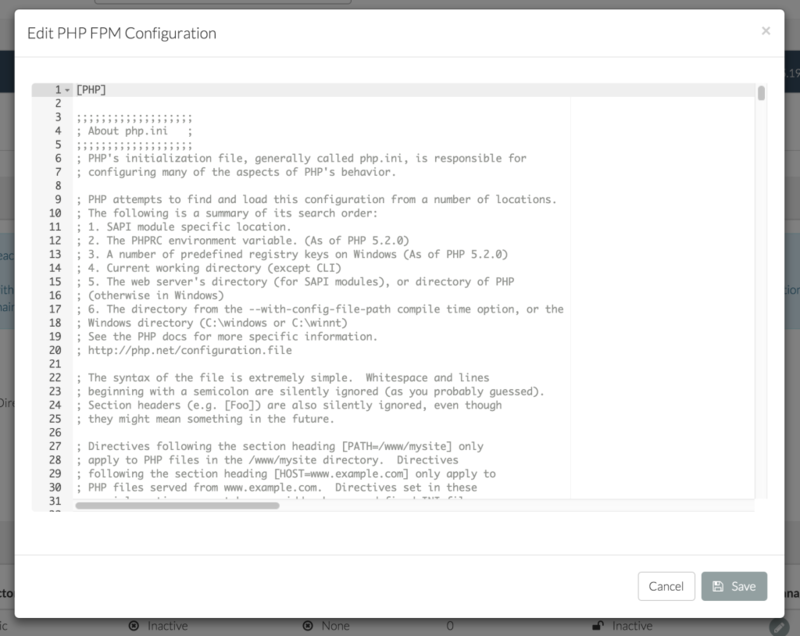 You might be thinking that manual deployment almost seems simpler and cheaper than Forge and, in a way, you’d be right – for an app as simple as the one we’ve been dealing with, Forge is probably overkill. But when things get complicated, when you have to maintain several applications per server or deploy bigger, more advanced applications with database migrations, backups, and more – Forge’s advantages become apparent. 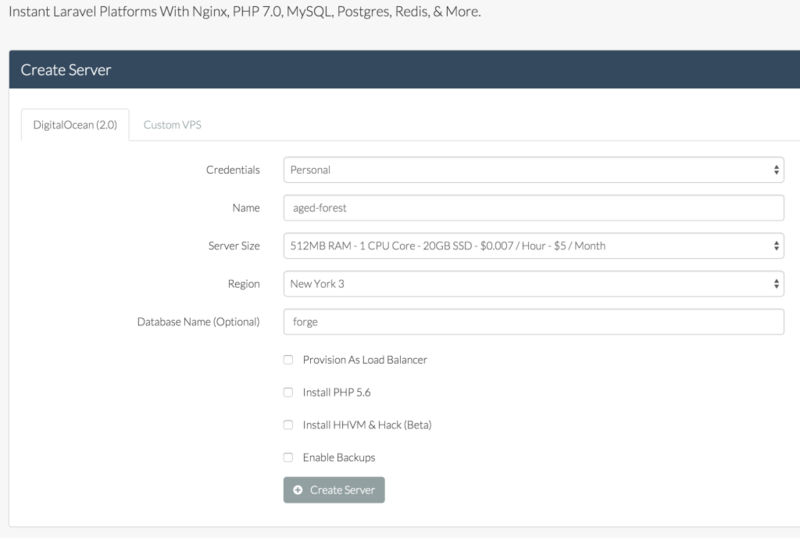 In this tutorial, we hosted our application on a PHP 7 server running on a DigitalOcean droplet using Laravel Forge, a popular server deployment service. We also deployed using the old school method of manual installation. The latter can be easily applied to any server running Ubuntu – so go forth and 7-ize! For the sake of brevity, we skipped advanced steps like automated testing and deploy hooks, or database setups. If that’s something you’d be interested in, let us know in the comments below and we’ll publish a followup expanding on the two approaches above by deploying a more enterprisey application. Do you use Laravel Forge? Or do you prefer to deploy another way? Let us know in the comments!